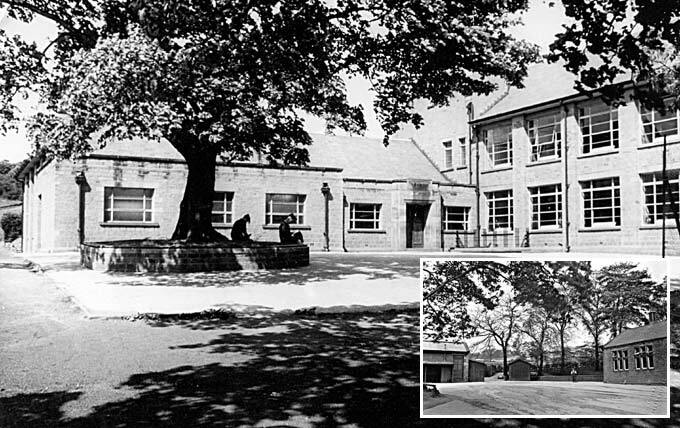 It's interesting to compare this view of the School yard with the one taken in 1937 (inset), just before the major pre-war building work was carried out to provide more modern laboratories, additional classrooms, a new entrance and a gymnasium/assembly room. Only the big tree remains (the exposed roots are just visible on the extreme left in the 1937 photo), now encircled by a slatted seat. On the right are the new physics and chemistry labs, with N1, N2, N3, a new staff room and an art room above. The building to the left of the new entrance is the changing room and shower area for the gymnasium/assembly room beyond.